In our house mom is the primary teacher. Dad works full time, so it just makes sense that he cannot join us as often as he would like. And let's face it, not all subjects does he consider a thrilling adventure. But, sometimes we get lucky on reviews and dad gets even more excited about the possibilities than mom. Such was the case when we read about EEME! Electrical Engineering for kids? Cool! As a matter of fact, the agreement was that if we got the opportunity for this review, HE would be in charge. GLADLY, he said! And gladly he did! "EEME's monthly hands-on project kits teach kids about electronics. Each project kit is paired with online curricula to not only teach kids how to assemble projects like lights, buzzers, and more, but to also teach them how the electronics works." 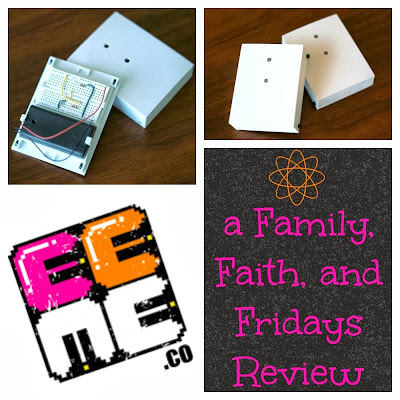 EEME is geared to 7-12 year olds and intended to teach them some basic electrical engineering concepts. Each month, for 5 months, everything you need to do the particular experiment comes right to your door. No need for any extra supplies. The first month's project is called Project Genius Light and comes with a breadboard, resistors, wires, LED and a battery. See this little box? Yes, that was it and quite frankly, my thoughts were, well, how exciting can this possibly be? The answer...exciting! The boys had so much fun doing this, and while I know this momma could have done it too, there was just something cool about getting to do it with dad! 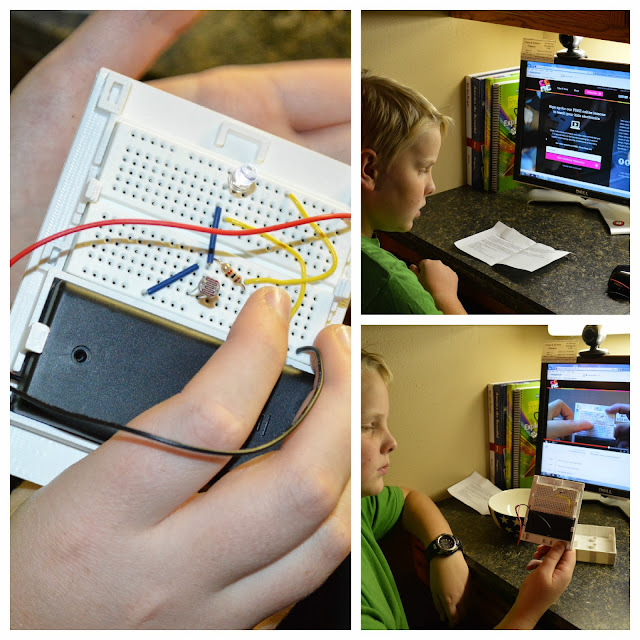 By logging into the EEMS site and following the how to videos step by step (about 45 minutes total) my boys put together an electrical box with a light sensor that turns on when it is dark and off when it gets lighter. My son was so proud of his work and excited to show off how it worked. He also could show us how to change the response by altering the location of the different parts. My husband has had a few engineering type classes and was very pleased at how the information was presented to this particular age group in a clear, concise way without being too watered down. He said the site was easy to navigate and the video quality was great. In addition, a few days after doing this physically, we received an email with a virtual experiment doing basically the same thing. This to me was really like a test to see if my son, almost 12, a few days later, could recreate his original experiment on his own, remembering what he had learned! He did! Interestingly enough, he said he would have liked to have done the virtual one first, then the hands on one. Like the hands on one, after some of the steps there were multiple choice questions to make sure your child is understanding what they are doing. As a subscriber you will also have access to additional activities on the web site. After watching the video on a multimeter my son announced he wanted to take an electrical engineering class next year! He may be young, but he loves this stuff! If you continue to subscribe, each month's kit will build upon the previous ones and has interactive quizzes to help with the learning application. Other projects include titles such as a DIY Display, Tentacles, Fade to Black, and tune. We are excited to continue this program and would highly recommend it! Do you want to see what you think? Sign up for FREE at http://eeme.co to preview EEME's video curricula. A basic subscription is $18.95 per month for the five month project curriculum. Every month for 5 months, you'll get a new packet of electronic components with all the LED lights, resistors, wires, and more that your kid will need to build a new project. I love children's books! With 4 kids, we have lots! Well, could you have resisted? The cover is beautiful! The story, even more beautiful! 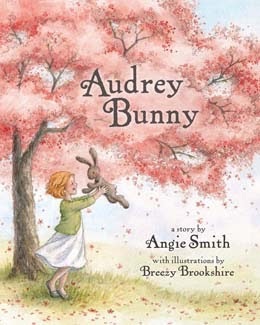 Written by speaker and author Angie Smith (I Will Carry You, Mended), Audrey Bunny, 32 page hardback children's book, is a keeper! When Caroline goes to the store to pick out a toy she chooses a bunny with a mark on it. The bunny, quickly and lovingly named Audrey, spends her days trying to hide the flaw on her until she realizes that Caroline has already seen it. Though she felt unworthy of being loved, Audrey realizes that she is loved dearly, just as she is. This is such a sweet story to show children that they can be loved in spite of their "imperfections" and that God made us just the way we are. We never have to hide from Him! We as parents can use this story of unconditional love to point children towards God and His unconditional love for us without being preachy. After reading the book to my youngest son, age 6, we were able to have a sweet conversation about how we chose him to be a part of our forever family and love him no matter what and how God chooses us and loves us no matter what and wants us to be a part of His family. An important message for all, but maybe even more so for an adopted child. Another thing that makes this book so special is the Parent Connection page at the end of the book. It begins with having you read to your child Psalm 119:73- Your hands made me and formed me. That is followed by 5 questions for you to ask your child to help facilitate a conversation on what you read and what they took away from the story. There is also a fun activity recommended at he end for slightly older children. You can purchase Audrey Bunny for $14.99, OR one of my readers can win a copy! Just leave me a comment of what your favorite Children's book is and I will enter you into a drawing. A random winner will be chosen on Tuesday, Nov. 12th! Do you have a spouse? How about a best friend? Are they one in the same? I would challenge you that they should be. Yes, I know, we all need friendships outside of our marriages, but I really do believe that our best friend should be our spouse. As my husband and I would testify, it has been the basis and success of our marriage for over 21 years. Feelings of romantic love may come and go over seasons of your lives, but a best friend is someone who is committed through those seasons regardless of emotions. There are many books out there on marriage, but a new one that trumps them all in my opinion is My Beloved and my Friend: How to be Married to Your Best Friend without Changing Spouses. 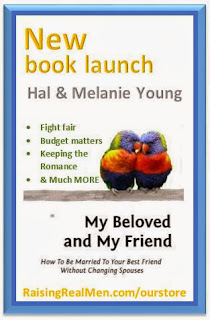 Written by Hal and Melanie Young, this 250 page book is filled with encouraging Biblical advice about how to marry and stay married to your best friend. Written during a health crisis and intended to be used as a way to pass on information to their own children they felt was vital pertaining to marriages, this book needs to be added to your library! Yes, I love anything put out by Hal and Melanie and this is no exception! The Youngs are the founders of Raising Real Men. I have mentioned them in the past because I simply adore them! The experience they have in raising 6 boys and 2 sweet girls makes them dynamic speakers and teachers in parenting. 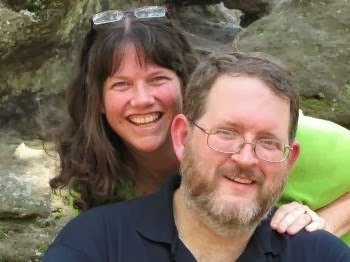 Their almost 30 year Godly marriage makes them a pretty good resource for giving marriage advice. Add to the fact that everything they speak of comes from their hearts and uses the Bible as the authoritative source, you cannot go wrong. Each one taken from a specific verse in scripture gives inspiring stories, concrete ideas to try, and invaluable words of wisdom from a couple who has been there, done that! I would be hard pressed to tell you which one was my favorite but let me tell you about a few things that have stayed with me since reading the book. "If a lady believes her husband is on his way to becoming a great man, he will be. If she has confidence in him, he'll have confidence in himself. If she respects him, he will have self-respect. If she believes in him, he will do everything in his power to live up to her expectations.." page 93 Oh, how I believe that and want to live that daily. How often do we see couples tearing each other down when they should be each others' biggest fans and supporters? "We would suggest that the question of labor division in the marriage is less about who does what than it is about advancing the family mission, enjoying one another, and serving one another." page 193 Amen! I love that instead of telling men and woman what they SHOULD be doing, the Youngs allow for room what works best in each marriage. While each of our situations may look different, the key is to work together and serve one another. That's the kind of marriage I want! "...wouldn't it make for peace if our first response to criticism was to consider our failings with humility rather than defend them with pride?" page 241 The word that got me there was PRIDE. I wonder how many times we allow our pride to get in the way of a beautiful relationship? May you be blessed in reading it and convinced that you can "be married to your best friend without changing spouses!" Pre-order a copy of My Beloved and My Friend: How to Be Married to Your Best Friend Without Changing Spouses for Christmas Delivery – two months before its official release date of Valentine’s Day 2014! $12 for Pre-Orders Only – with Free Shipping! Boy, would I like to be! The Pioneer Woman that is! I am catching up, I am sure of it. I even told my husband I think he married the real Pioneer Woman. His kindly answer, "No, I did not!" This family has been busy learning a lot of new things since our move west. There are some things that are just made for western living...growing your own vegetables, raising chickens, canning food, butchering cows. But just like anything else, some of those things are just better learned from someone who knows what they are doing. 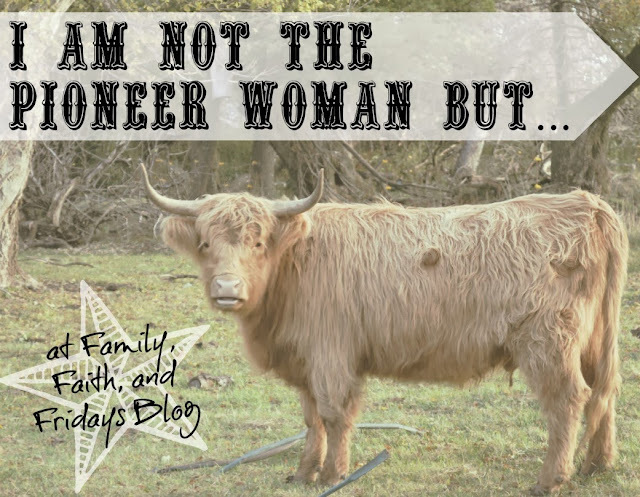 Luckily, we have met wonderful new friends that are humoring us and putting up with our crazy ideas and teaching us a little about homesteading. 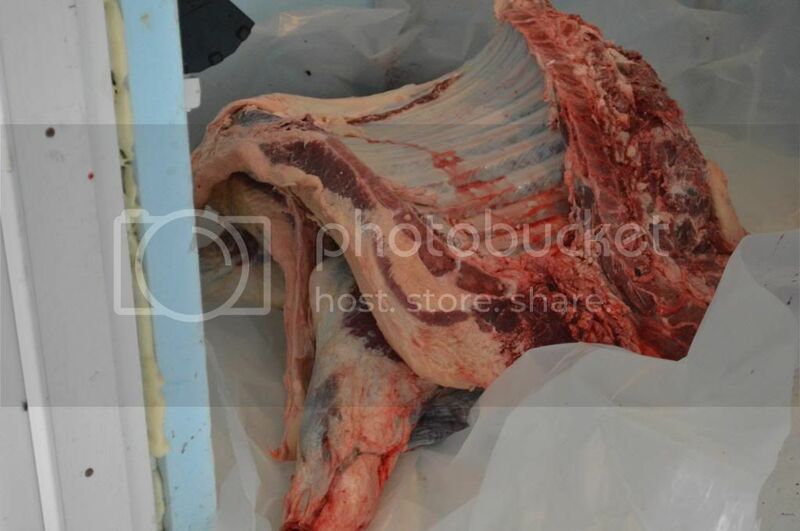 Yes, this family has butchered it's very first cow. (That's it up there!) For those who are concerned, don't worry, I have kindly put most of those pictures in a separate place for your viewing, or not, pleasure. (You can thank me later!) Even then, I promise I tried to be as careful as possible as not to offend. If you think you will be, please just skip that link. I do not aim to lose you as a follower! On the surface, butchering a cow seems harsh to me. After all, they are cute and once were probably even a little cuddly. Thank goodness, I have not known this one that long. I am still not sure how I would handle the whole thing if I had raised that cow from birth. It was hard enough that our friends have what I consider beautiful cows. They look like big teddy bears, and I did ask if we could not call her "her" but it. Hey, it made me feel better! I will also just tell you upfront that I wimped out and did not stay for the kill. I was just was not sure how I would feel about that, so for my first time, I decided to play it safe. My oldest son and I reentered the activity in the middle of the skinning process. It is an amazing process and I was proud of myself for being able to handle it. We skipped the gutting process (hey, I told you I am not QUITE the pioneer woman yet) but did go back while it was being cut up. At that point it was just a piece of beef. Chalk it up to too many old Rocky movies, maybe. 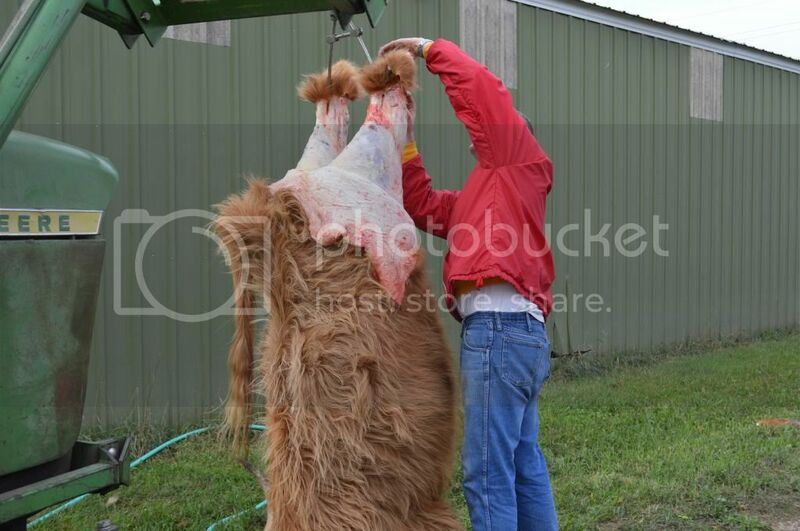 Did you know processing a cow takes a lot of time? It does make you understand slightly more why you pay such high prices at the store. It is not a quick process. We spent (meaning mostly our friend, with a little help from my hubby) a half day one weekend and then, with four of us working, about 7 hours a second weekend. While the men cut sections and ground hamburger (our friend is a chef, so BONUS) the women packaged and sealed up all the meat. Sounds like an easy job, but not so! Because we want the healthiest food possible going into our bodies and that of our four children. Knowing that a cow, or any other choice of meat, is raised locally, humanely, and without a bunch of junk going into their bodies makes me feel better. When we are eventually done with our current way of life (military/moving) we pray that The Lord will allow us to raise our own animals on some land. I told you I was working on being the Pioneer Woman! Hopefully we will remember all that we learned last month. I also hope that this experience has taught us to be more appreciative of where any of our food comes from and who helped to get it there. Regardless of the details, raising or producing food is HARD work and I would be willing to bet a pretty thankless job. I think my kids have a much better appreciation for the farmers of the world now. Next week, I will show you my other new skill in the kitchen! Pioneer Woman, watch out...this city girl is learning lots! A BIG thank you to the H family. We could have never done this without you, and your cow obviously, hee hee, and we are blessed to call you friends. The Lord has used you to help open up doors that we never dreamed could be opened and we are having so much fun learning from you. Your patience, guidance, and friendship are much appreciated. 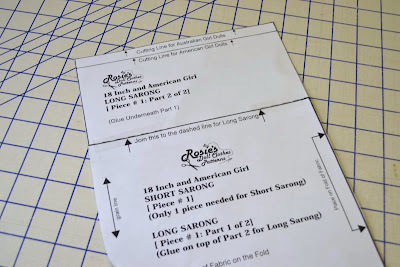 Linking up with Amy today at Raising Arrows! Hop over to read posts from some amazing bloggers! Do you love sewing in your house? How about dolls? We would answer yes, to both of those! 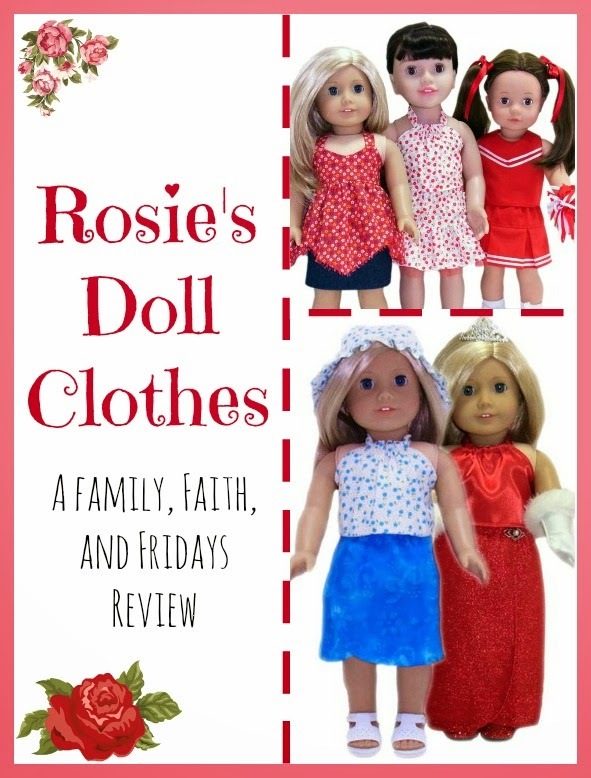 Even though my girls have grown out of the doll stage we have a few precious ones set aside to pass on to the next generation and that we pull out occasionally to share with little visitors. 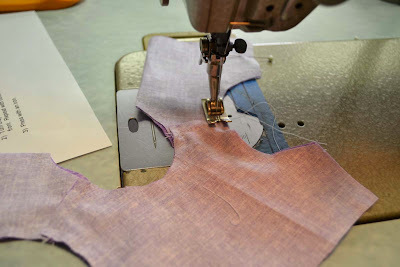 And the sewing machine- well, it is a little bit quieter these days with my oldest at college, but it still gets some use! 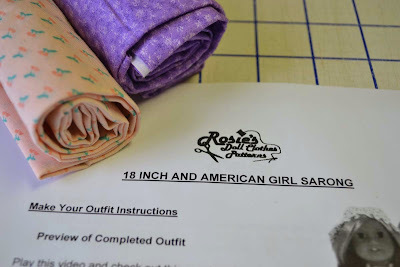 I believe that sewing is a dying art, so I was excited to see the review possibility for Rosie's Doll Clothes Patterns! 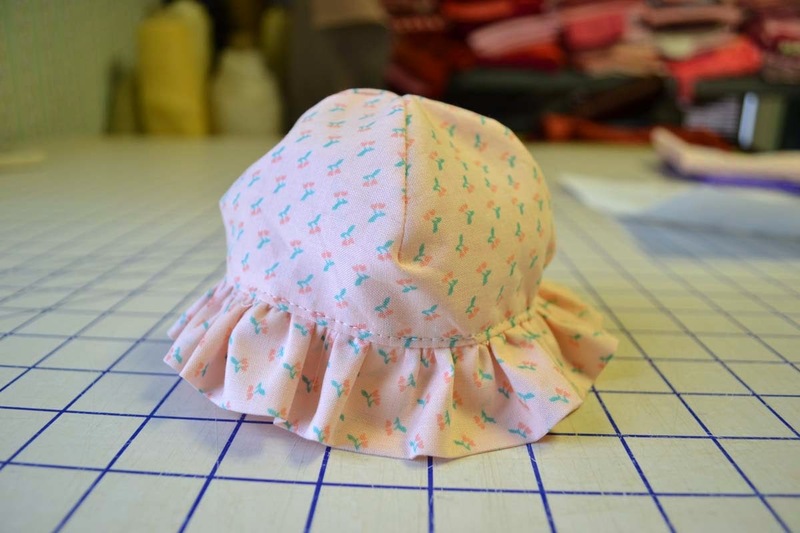 What a great way to teach young people, recommended for ages 8 and up, to sew with something that is fun to do! Yes, that is a lot, but again, each video is broken into a manageable chunk for younger children to be able to handle but still challenging enough for a experienced sewer to enjoy. In addition to the patterns that are supplied for you to print out, there is a step by step video series for each garment you can make. 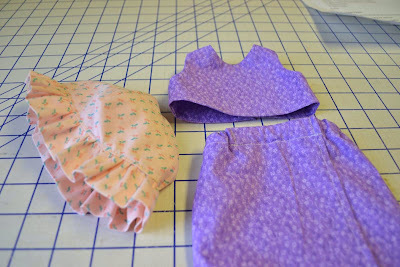 I chose to use three patterns, the crop top, sarong (which is more like a wrap skirt), and hat. 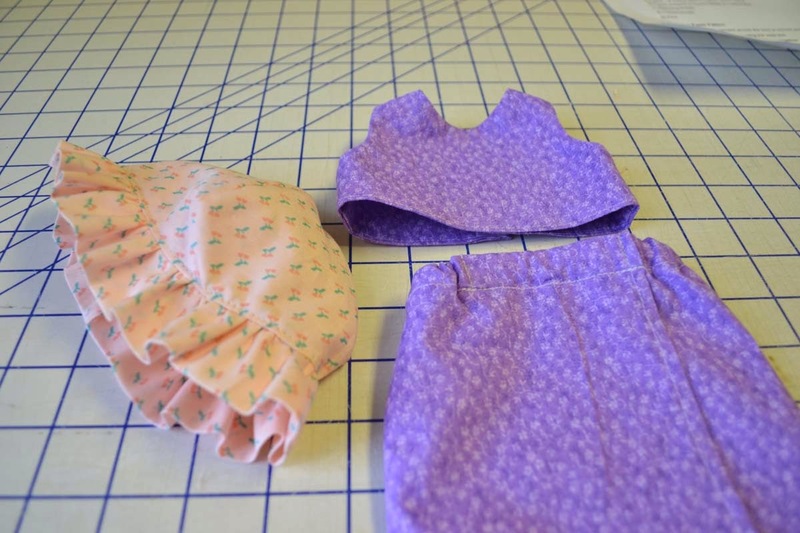 The instructions are really easy to follow, and the videos walk you through step-by-step! 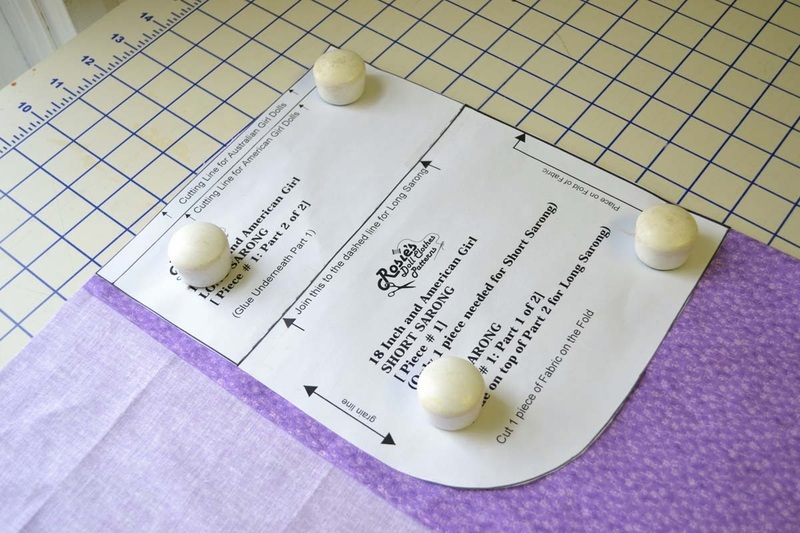 The pattern pieces are also really easy to use, and clearly marked. 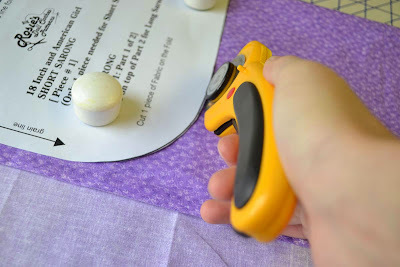 glue them together, and you are ready to go! Helpful hint - make sure you turn off the print to size feature on your printer or the measurements will be slightly off. 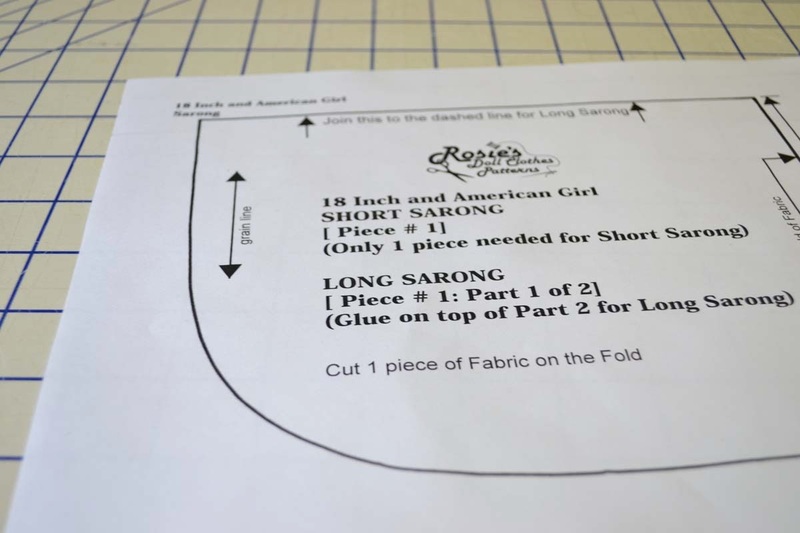 I cut out the sarong using weights and a rotary cutter. This method takes some practice but is super quick once you have the hang of it (and can control your hand). 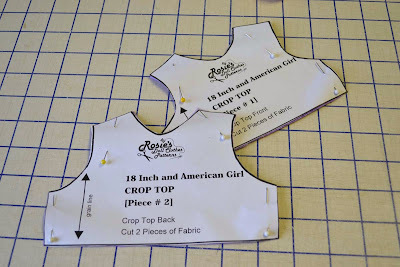 I cut out the top using the traditional pins and scissors method. 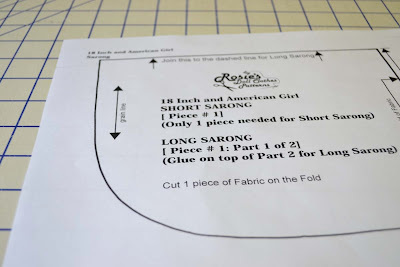 -BONUS tip- Don't cut out your pattern piece beforehand. 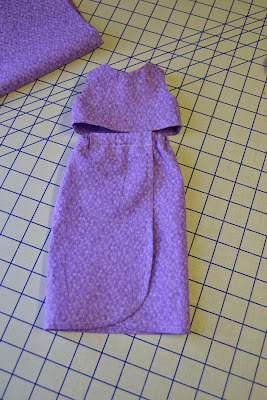 Just lay it on the fabric, pin, and cut. 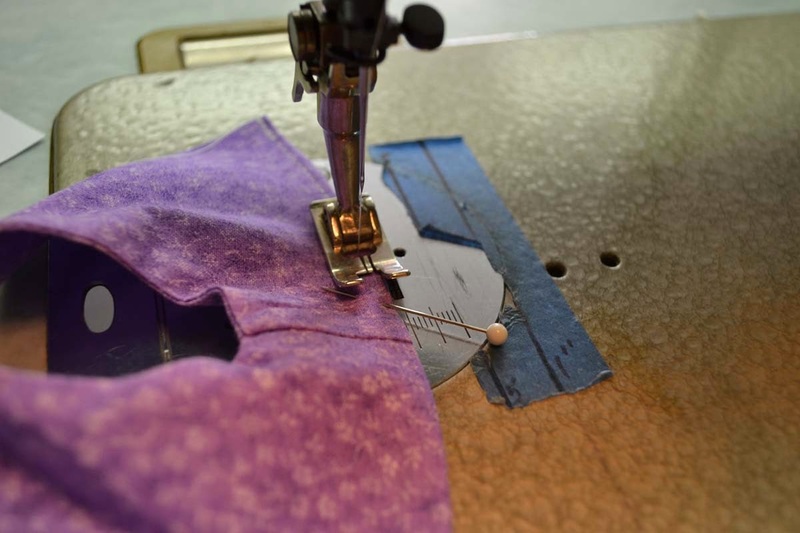 Not only does it save time but it also stabilizes the pattern and your fabric while you cut. 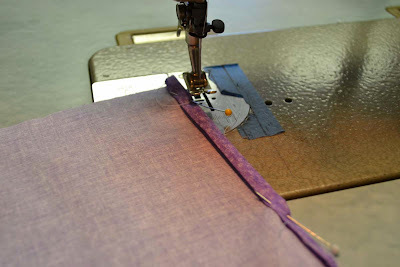 Sewing! I used one of the industrial machines where I work, but you can use your home machine and be just fine. Ta Da! Not super fancy because I'm not at home and didn't have any cute trims available to me, but super cute all the same! Yay! 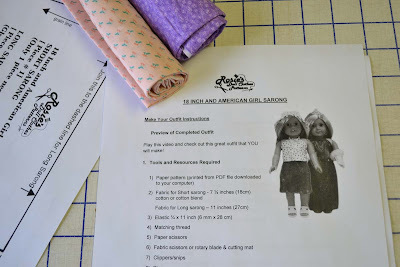 This was super fun, and I wish I had had these patterns and videos when I still played dolls. I think my favorite thing about them is that there is so much room for customization and alteration. 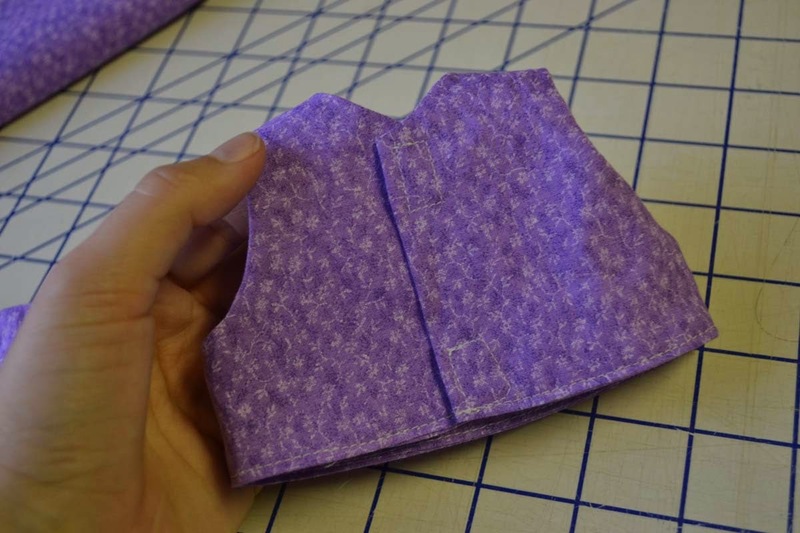 You can easily change up the patterns to look exactly like you want! 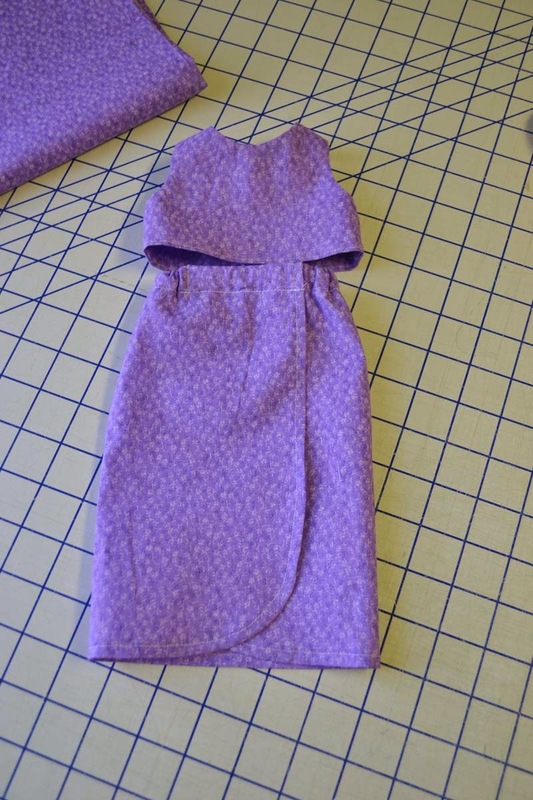 I did pick up a few new techniques and ideas when working with smaller garments and I love having these patterns to hopefully use with my own children someday. I do think that the level of difficulty is appropriate for elementary age kids with some supervision (because of safety with the moving parts of a sewing machine). 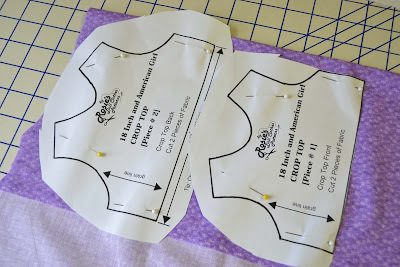 The directions are clear and easy to follow and the patterns are ones that will appeal to young girls, especially. Michele here! As you can see, these are some cute projects to do! With sewing being a harder art to find a teacher for, I think it is wonderful that a company like Rosie's exist to pass on the knowledge of sewing and the skills it takes. 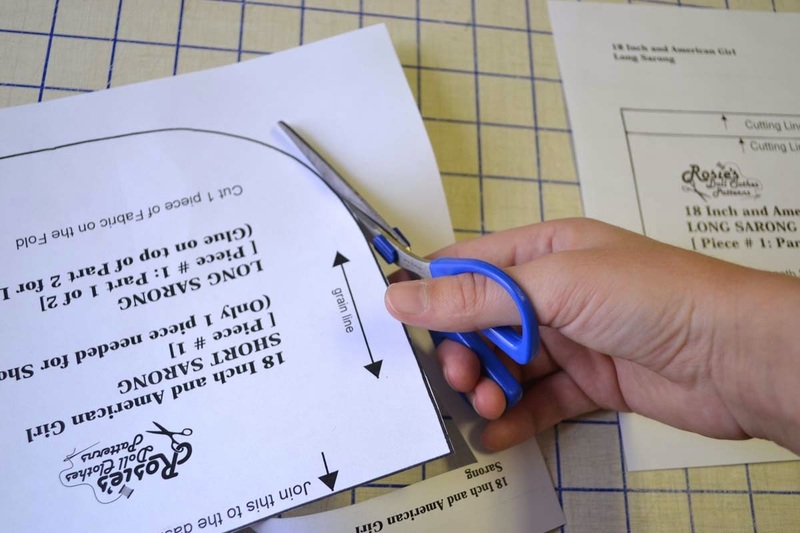 While you may be able to learn some of the techniques from a basic book, there is nothing like a "real, live" teacher to show you how to do something, especially for visual and auditory learners. 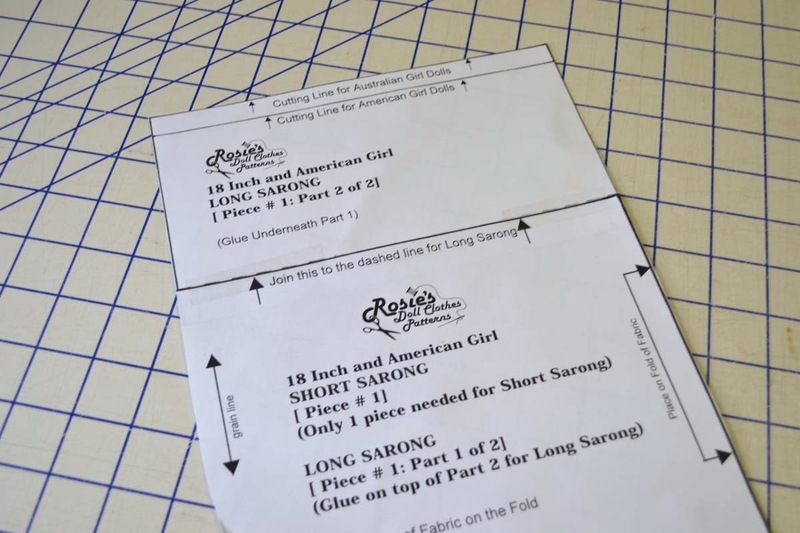 One of the other things I really appreciated about this videos was that Rosie did not jump right into the sewing, but took the time to teach you about the things involved in sewing first, from the fabric to the tools you should have. 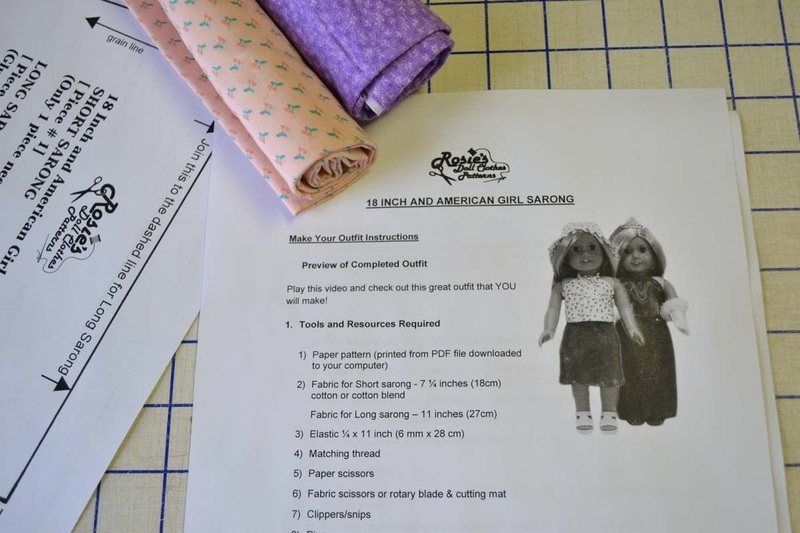 If you had no previous sewing knowledge or "stuff" on hand, you would know exactly what you needed to buy and how to get started. Many programs assume you know those basics and that is often just not the case, especially with younger sewers. Based on our experience, we would highly recommend this program not only to new sewers, but also to more experienced ones as well who are looking to add some new skills and techniques to their knowledge! Fellow CREW members also used this program, many with their younger children, so I would encourage you to check out their reviews by clicking the banner below. Enjoy looking at all the young talent and the fun creations they made. So cute!!! Rosie's Doll Clothes Patterns 12 month Online option can be bought for $47.85. If you wish, you can also now buy the DVDs for $67.02. I have had so much fun doing book giveaways for the past 8 weeks, but now it is time to move on to some things to pamper us! 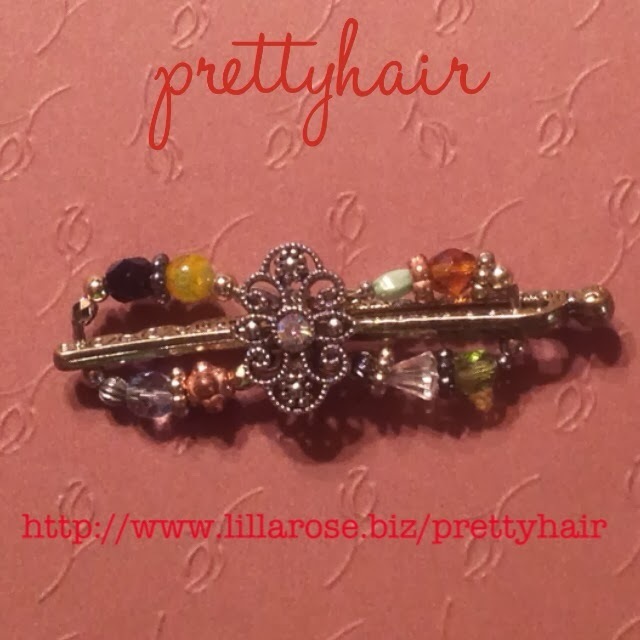 Let's start out with Lilla Rose! 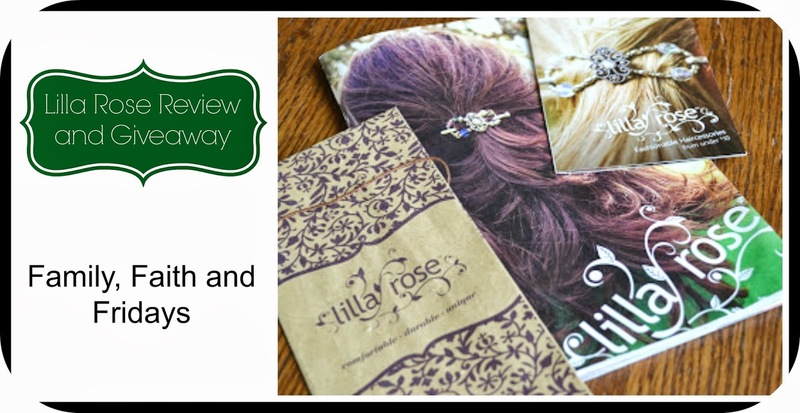 I was introduced to Lilla Rose Company a few months ago when fellow Crew member, Jennifer, offered to send me a few of their flexiclips for my daughters and I to use and review. No surprise that we loved them right away and had fun using them. The girls even did a hair tutorial for fun! Since then we have ordered a few more and using Jennifer's buy three, get one free for new customers, we earned a free item as well. The hair sticks are what my 15 year old chose to try out this time. I was pretty skeptical of them honestly, because for the life of me I cannot figure out how two sticks will hold ones' hair in place, but they do! As a matter of fact, she really likes using them and thinks they are even easier to use alone that the regular flexiclips. Such a cute way to do your hair! I still love the flexiclips best and have been pulling my hair up more and more. It use to be that you could tell I was having a bad hair day or just being lazy by whether or not my hair was pulled up. Now, with a little more stylish clip to use, I find myself doing it because it is just fun and makes me feel good. The newest style that I like is the Flexi-oh ring. These cute little two sided things are great! 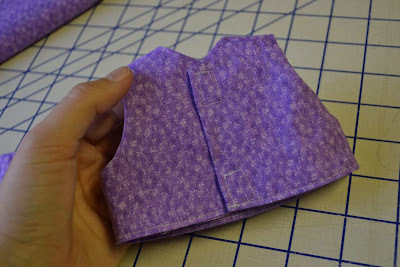 Each side is slightly different so depending on which size you put on top, you can have two different looks. Too cute! Rather than just putting a rubber band it your hair, these dress your simple ponytail up a little more. Not to mention you do not have to worry about them popping in half and hurting you. I will say that I have a slightly harder time getting these in my own hair, but have gotten better with it with practice. They are very easy to put in my daughter's hair! 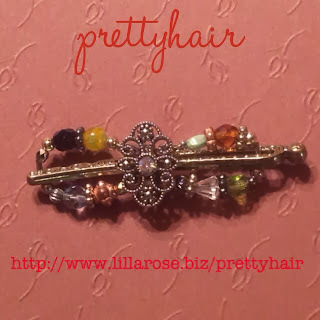 Jennifer has graciously offered to give away this beautiful flexiclip to one of my readers. I love the colors in it...it will match anything! Just enter the rafflecopter for your chance to win. Thanks Jennifer!! Hi, my name is Michele, and I AM a curriculum junkie. Seriously! We have boxes in our garage labeled for each year, K-12th grade. In each box are things I hold near and dear in our schooling journey. Books, workbooks, papers, schedules. Some have been around since I started this journey 15 years ago. Others are brand new. Each are loved for different reasons and all I could spend days telling you about- the good and the bad! That is really the reason this blog started. Curriculum. I saw a friend getting to review all kinds of curriculum and I was hooked. For the past year and a half I have had the wonderful opportunity to review curriculum and other family friendly products for The Old Schoolhouse Magazine. Each month I have tons of options to choose from! They arrive at my door and we dive in for 6-8 weeks, exploring the good and the bad. Then I get to come back here and share what I think with you. I pray continually that people are blessed and I wish that I had had someone "older and wiser" (that is funny!) to help guide me through the enormous amount of stuff out there. As my year is winding down (4 more reviews left this year! ), TOS is gearing up for a new Crew year to begin in January 2014! 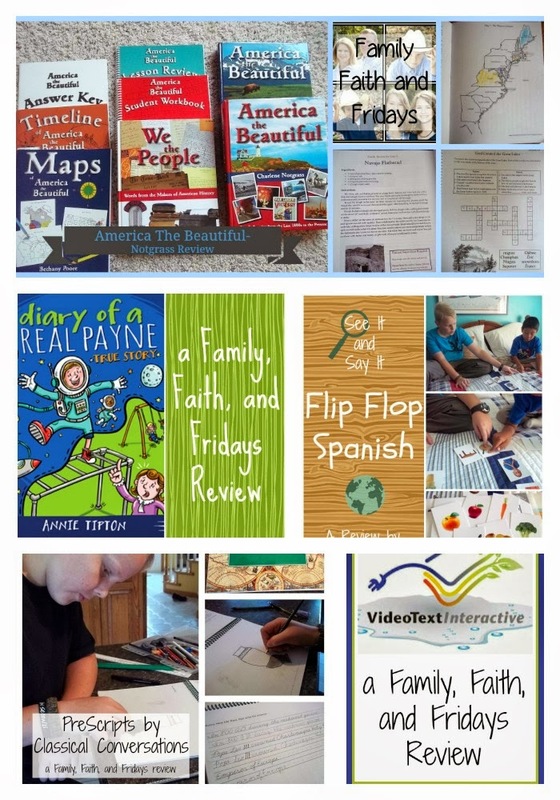 If you are a home school blogger and curriculum junkie and think you would enjoy writing reviews, then you might be perfect for the Crew! *First of all you must be a homeschool mom or dad. You don’t have to homeschool all of your children, but you must homeschool at least one. *You must be willing to use the review products for about six weeks in your homeschool, before writing your review. Review periods have deadlines and requirements for the reviews. You must be willing to follow these requirements. No, that doesn’t mean you must write a positive review. But it does mean that there are certain elements that are required. And the deadlines are firm. If you are often late for deadlines, the Crew is probably not for you. *You must have a blog on which to publish your reviews, and be sure you have an active blog with a following. By active blog, I mean that you should be blogging regularly, at least weekly, about your family and homeschool (in addition to your reviews). Your blog should have followers — RSS feed or email subscribers, as well as in social media. The Crew does not accept brand new bloggers who just set up their blogs for the purposes of applying to the team. *Are you using social media to promote your blog? Activity on at least one social media platform is a requirement to serve on the Crew. Which one is up to you — Facebook, Twitter, Pinterest or Google Plus are the options. You will need to be willing to promote your reviews there and post a widget or plug-in publicly on your blog, indicating how many followers you have in social media. *You must be willing to check into the Crew's Review Management forum. This is where information is disseminated to the team. The leadership does everything possible to make things easy for us, outside of writing the actual review, but you need to be willing to participate by checking in almost daily. *Sample reviews are helpful. If you’ve never written a review on your blog, go ahead and write one for curriculum you are currently using in your homeschool. This will help the leaders see how you approach writing reviews. Why should you want to be a part of the TOS Crew? After making sure you meet all the requirements, if you believe you would to an asset to the Schoolhouse Review Crew and wish to join us, please click over to the Schoolhouse Review Crew blog to apply. Hard work? Yes! But oh, so worth it! I have been blessed a million times over by this opportunity and know you will be too! My boxes are now a little more full, my heart a little more blessed, and my friends a little more spaced around the globe. Want to join me, fellow curriculum junkie? Home Survival Week- Hits and Misses! Fun Friday- Two Months of Giveaways, week 6!